How about a nice bottle of Chateau Lafite Rothschild? 2010 was a good year. You can get a bottle at Total Wine & More in Bellevue, Washington for $1,199.97. But that is one of the most well known wines in the world. A First Growth of Bordeaux's famous 1855 classification. Let's tone it down a bit and settle for a Second Growth Bordeaux. Chateau Cos d'Estournel has a solid reputation. And you can get a bottle of the 2010 from Michael Towne Wine & Spirits in Brooklyn, New York for only $259.99. The driveway to Chateau Lafon-Rochet -- During 2000, the owners repainted the chateau and winery to its current yellow color. As quick background on the Cabernet Sauvignon-dominant wines of Bordeaux's "left bank," in 1855, Paris held a world's fair. To organize the myriad French wines shown at the fair, Bordeaux's wine brokers devised a classification of Bordeaux's best wineries, ranking them from First Growth to Fifth Growth. These rankings corresponded to the average price for each wineries' wines (First Growth: > 3,000 French Francs per barrel; Second Growths: 2,500 to 2,700 Francs per barrel; Third Growth: 2,100 to 2,400 Francs per barrel; Fourth Growth: 1,800 to 2,100 Francs per barrel; Fifth Growth: 1,400 to 1,600 Francs per barrel). With a couple changes, the original 1855 classification remains intact today and most all critics agree that it continues to hold surprisingly true regarding wine quality at each classification level. To be sure, there are tons of wineries in Bordeaux that are not classified. The classified wineries are the creme de la creme. Today, there is endless debate among wine critics over which wineries, if the 1855 classification were redone, should move up or down the rankings. Indeed, discrepancies abound in the marketplace . For instance, Chateau Pontet-Canet, a Fifth Growth, is known for commanding prices similar to Second Growths. At Millesima in New York, a 2010 bottle sells for $260.00, the same as the Second Growth Cos d'Estournel mentioned above. Chateau Lafon-Rochet is classified as a Fourth Growth. But lately it seems to be punching above its weight class. Decanter Magazine (this, along with Wine Folly, are my go to sources for wine knowledge -- Wine Folly for the basics, Decanter to dig deeper) suggests that Lafon Rochet could be the the most improved of the 1855 classified wineries. High praise! Nonetheless, its wines are still available in the U.S. for around $40-$60 per bottle. Not cheap, but not unfathomable. Last week, Nicole and I booked a reservation, hopped in the Fiat, and drove an hour north from Bordeaux for a visit. The chateau itself is striking. You can't miss its sunshine yellow color set against the green of the surrounding vines. Why did we love our visit so much? The story, the setting, and the wine! The story of Lafon-Rochet is the story of the Tesseron family who took over the neglected chateau in 1960 and set about revitalizing it. In 1975, the family purchased nearby Chateau Pontet-Canet, mentioned above. In the early 2000s, family patriarch Guy Tesseron divided oversight of these wineries among his four children. Today, Guy's grandson Basile manages the chateau. We got a chance to say hello to both Basile and his father Michel during our visit. 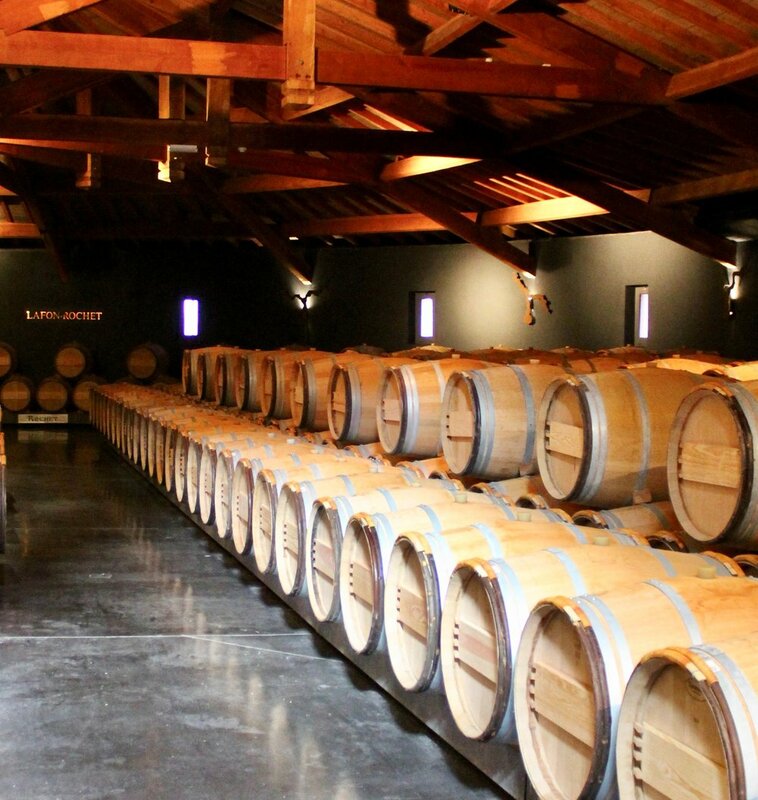 The Tesseron family has invested heavily to make Lafon-Rochet a player today. We saw this immediately upon stepping into the recently renovated winery facilities. Beyond new functional equipment, the family brought in an architect to make the space more visually appealing to visitors. They also hired the former winemaker at Petrus (one of Bordeaux's elite wine producers) to consult on the winemaking. Pipes run through the walls of these cement vats in order to regulate the internal tempature of the fermenting wines. Lafon-Rochet's setting only adds to the story. Primarily because its vineyards are adjacent to Chateau Lafite Rothschild and other famed wineries. Nicole and I drove a quarter mile down the road to take the below picture. Chateau Lafon-Rochet implemented the yellow label to match its repainted estate. A label from before the estate's repainting is on the right.